If a gladiator put in a performence of a lifetime, or did someting that might be unheard of in the ampitheatre, they could earn their freedom on the spot. Of course this was not all that common, and great performances would often make the crowd and emperor want to see this gladiator fight again. A gladiator hoping to earn their freedom after a brave and long battle. If a gladiator had served a number of years, typically three to five and was a favourite, they might be due a repreive from the sport. In this case they might be awarded the rudis for a great career having fought enough to satisfy the crowds desire to see them and also earned their freedom. Of course a gladiator could be awarded a rudis at any point, but this was not thought to be common early on in a gladiators career. 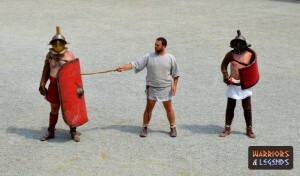 With new gladiators, they would have to fight to get a reputation, and if they had a favourable one, its likely people would want to see them fight again. Because of the nature of the sport, it was thought that gladiators may earn their freedom from around three to five years of fighting in the amphitheatres of Rome. The rudis was the symbol of a gladiators freedom and was a small wooden sword. It was said the rudis should be carried on their person at all times, in case their freedom was questioned, they could show their rudis. To earn their freedom a gladiator would need to be awarded a rudis as displayed here. Freedom was an option for the gladiators of ancient Rome, through great performances, many wins and years of service or *buying their freedom, a gladiator could escape. Of course many did not, it was not common for gladiators to survive many fights or even live beyond the age of 30, but there was always hope for those new gladiators, they could surive, and they could earn their freedom.